If you came to the last BAO House Pop Up at Loaf, waited in that incredibly long line and were rewarded with food, you’ll be excited to hear we’re doing it again. 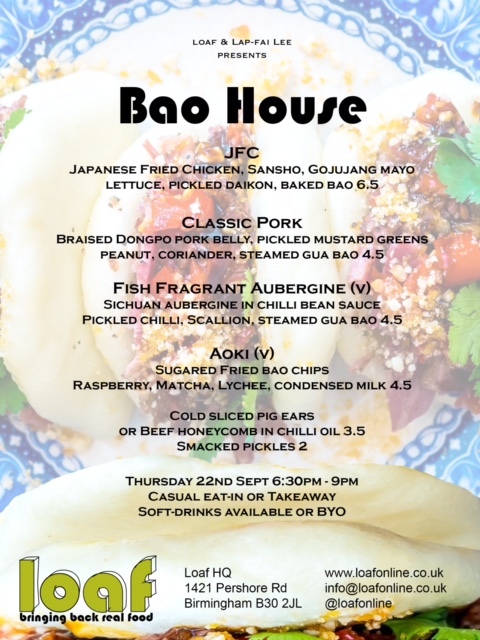 If you came to the last BAO House Pop Up at Loaf, waited in that incredibly long line and didn’t get food because we ran out, you’ll be excited to hear we’re doing it again – with more BAO, extra sides…. but you should still get here earlier. September 22nd is the date for your diaries. All food is to take out, but you can sit in if you’d like – we have seating. Cash or Card payments taken. Next post: New dates for courses 2017!